John B. McLendon was the last living protégé of basketball’s inventor, Dr. James Naismith, and one of the “top ten basketball coaches of the century” in Billy Packer’s opinion. McLendon’s amazing records in college and pro basketball earned him a spot in the Basketball Hall of Fame (the first black coach to be inducted), and his coaching philosophy has had a huge influence on basketball coaches. Breaking Through is also a powerful and inspirational story about segregation and a champion’s struggle for equality in 1940s and 50s America. 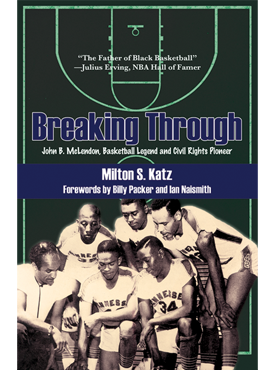 Black Magic, ESPN’s Peabody Award–winning documentary about players and coaches who attended historically black colleges and universities, covers many of the events in McLendon’s life that Katz writes about in his book. John McLendon was elected to the Naismith Memorial Basketball Hall of Fame in 2016. Milton S. Katz is professor of American Studies, School of Liberal Arts, Kansas City Art Institute.